Wi-Fi has become essential part of our lives and we can’t imagine a day without Wi-Fi. Wi-Fi is the most cost effective and reliable form of internet connectivity. If you have a Wi-Fi connection at your home your all gadgets are connected to it. Wireless connectivity is the most satisfying thing while using Internet. But all this is achieved using a device called as Router. All your devices are connected to the router. Router is a device while helps us to connect to the internet using Wi-Fi signals. But on the other hand slow Wi-Fi speed can land us into frustrating mode. Slow Wi-Fi speed can stop all our work. There are several reasons due to which Wi-Fi speed can get slow. Wrong placement of your router is the most common reason for slower speed. Your Internet Service Provider can also be a reason for slow Wi-Fi speed. Usually range of Wi-Fi router is minimum 150 feet. Closer device to router gets better speed and the vice versa. Here are some tips which can help you to boost your Wi-Fi speed and signal strength. Placement of the router is the most important reason behind your Wi-Fi speed. Always keep your router at centre location in your house so that you can signal coverage all over your house. Your might be ugly, still don’t hide it in a corner. Keep in mind that there should not be more interference between your Wi-Fi and your gadget like a wall. This is the best hack to direct your Wi-Fi signals. 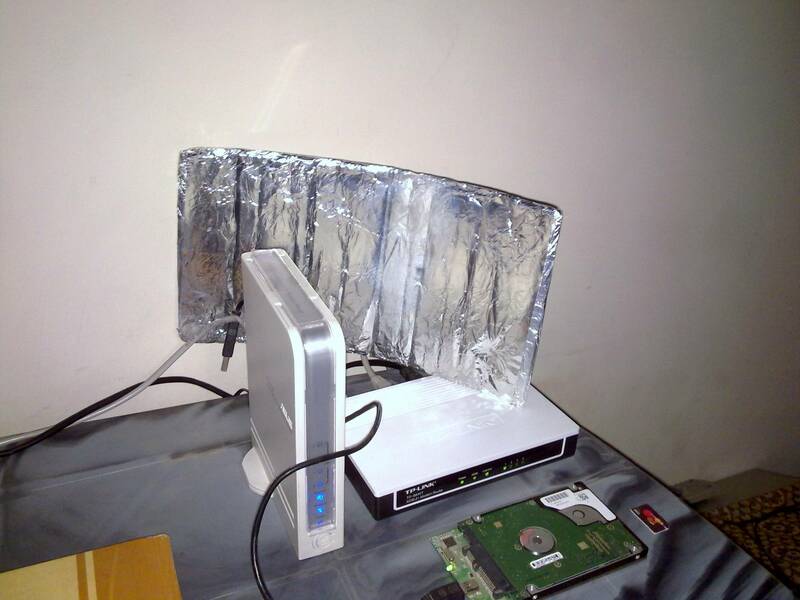 If you paste a aluminium foil after you router to wall where you don’t want signals to go, the aluminium foil works as a reflector and reflects back all the signals to opposite direction. This can help you to great extent if you want your Wi-Fi signals in one direction only. Placing your router at higher location is a very useful to strengthen your Wi-Fi signals. If your router is on ground level lot of object might create interference between router and your gadget. Placing the router on top location reduces the interaction of various objects and router’s signals thus resulting in better Wi-Fi signals. It’s not only your router which emits wireless signals. There are lot many electronic gadgets which generate the signals. Cordless phone, microwave oven, Bluetooth device are some of the devices which have their own wireless signals. These signals can affect your Wi-Fi signals. So keep away your router from all the electronic devices. These days routers are very powerful and usually come with two antennas. Always point your antennas in the direction where you need more signal strength. This does not affect a lot but does help. There are several applications which can hog your bandwidth a lot. Video calling, live streaming, live gaming are some of the applications which consume lot of bandwidth. You can define your priorities while using Wi-Fi. You can use QoS (Quality of Service) for this purpose. It might happen that it’s not only you is using your Wi-Fi, a thief outside might have hacked your password and is using your Wi-Fi. Hacking a Wi-Fi is very easy as there are tools available to hack your Wi-Fi password. But still you can secure your self. Use maximum available security on your router. Keep changing your password on regular intervals. Wi-Fi normally works on two bands. 2.5 ghz and 5 ghz. But usually we use 2.5 ghz, because our router supports only one band. You can buy a new router supporting both the bands. You get good speed when you use 5 ghz band. Here the frequency of the signal is much higher and has less distraction from other signals resulting in good speed. Your Wi-Fi signals operate in various channels. There can be several routers working around your router. You can easily analyse in which channel your router is working. The you can use the channel which is less used. You can analyse your signals using Wi-Fi analyser tool. It is your router which defines your Internet speed after your ISP. If you are a geek, gamer or a heavy user you should definitely consider buying a new router which has high configuration. Get a router which operates on both the bands i.e. 2.5 ghz and 5 ghz. Consider coverage while buying new router if your home is big and you need signals everywhere. These were some tips which will definitely help you to boost your Wi-Fi speed boost your Wi-Fi signals. If you have any such tip do share with our readers by commenting below. The positioning advice is incorrect here, they give you two antennas so you can get polarization diversity (wiki it, basically signals coming from different directions can be weakened due to the direction they came from once they hit the antenna), the first should be at a 35 degree angle and the 2nd at 145 degrees (or at least ensure they are different by 90 degrees) to get the best signal strength at any orientation of the receiving antenna relative to the transmitting antenna. I must have definitely missed this one.